Run a Month Club: Breaffy 10k! Eight months into our 'run a month' project, Kevin and I travelled to Castlebar, County Mayo, to compete in yesterday's Breaffy 10k run. We came from opposite ends of the province, as I had spent the previous night in Sligo at a friend's stag party. This was a very well organised event, which obviously had the support of the local community as it weaved in and out of the village's little back roads. Young and old stood outside their houses clapping and cheering the runners as they passed and many provided water and refreshments along the way. Kevin and I were a little apprehensive about performance at this run - I had a bit of a tummy bug for the previous few days and Kevin's training had slowed slightly, but we performed well enough. We ran the first 2k well within ourselves, finding a steady pace, letting the crowd run on ahead of us and settling in to the run. From then on we gradually overtook many runners, keeping our form and pace. We finished in 52.57 - happy enough with that and ready to up the training for autumn time. A nice steak and chips were the order of the afternoon after the race while we watched the football on tv... life could'nt get much better! The Ger Kearney 4 Mile Memorial Run! A few days after my mammoth cycle D and I took the two hour southerly trip to Wexford, where I would link up with brothers Richie and Cormac to compete in the Ger Kearney 4 mile run. They call this part of the country the 'sunny south-east', but it was as rainy as any other part on the day of our run! It didn't matter a hoot for us trotters though, and amongst the many competitors was our Mom - celebrating her 70th year in style! My mother and father had six children and all, barring myself, are scattered to the four corners of the island - all married and rooted elsewhere. Richie is well settled in Wexford now and a regular first team player with Tombrack United! Hence the reason for this run: to raise money for their football club and to honour the memory of a much loved local runner. 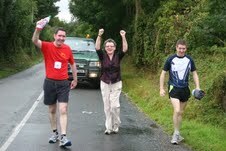 Cormac romps home in the Ger Kearney Run and we join Mom for her heroic finish! The course, though short, was fairly difficult and well packed with hills. Cormac and I set off at our own pace, running initially within ourselves and picking it up as we went along. I could definitely feel the long cycle on my legs and couldn't stretch as I would have wanted but still I was happy enough with the run. I finished in a time of 31.45 with Cormac coming in at 33.54. Richie himself was the chief organiser (and he did a fantastic job) so he didn't actually compete. Cormac and I doubled back after the run and walked the triumphant journey with Mom and Deborah (Richie's wife). We had a fantastic night in Tombrack afterwards - Dad played a starring musical role! I Cycled Ireland, I ran Wexford! These last ten days have been an internet-free zone, as I trudged the country on foot, cycle and tyre! I set off on Monday, 15th August, on a personal odyssey - to cycle across Ireland in three days to raise money for the Jack and Jill Foundation (to care for sick children). The idea came to me a month earlier - so I had to buy a bike! Relearn how to cycle! Acclimatise my posterior... And start fundraising... My brother Kevin and brother in law Mark had hoped to join me on the full cycle but unfortunately they could only make it for parts of the journey, yet were it not for those two lads I wouldn't have done the requisite training or planning. The lads and I set off to BT's positive sign! Monday morning: up with the lark and feeling great. Had breakfast, packet my gear (light change of clothes in rucksack!)... watched a 'youtube' video on how to change a bike tyre! Kevin and Mark were to accompany me on the first 30k, out towards the village of Maam. We were delayed slightly due to a tyre problem on Kevin's bike (youtube video came in handy already) but we were on the road by 10am. I'll never forget climbing up Ard na Bleaisteiri to see my cousin, aunt, father and mother out waving us off with makeshift banners! We were doubly waved off by sister Roisin and friends Ronan and BT up at the village and away we went... The first 30k were a delight, with great banter between the three brothers. Weather conditions were perfect - no wind, no rain. I felt sorry for the lads as we descended toward Kane's pub in Maam, because the descent, which ran for at least 4k, would have to be climbed by the boys on the way back! After a cup of coffee and warm toastie, I set off on a long solo journey, while the lads cycled heroically back up the hill towards home. 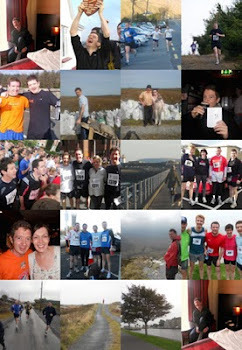 I would link up with Mark again on the third leg of the journey, from Cavan to Louth. Maam to Cong was absolutely stunning, but slightly tough. Lough Corrib was beside me all the way, providing the eye-candy! I broke for another coffee in Cong, and felt strong. My plans were to cycle 114k that first day, going as far as Castlerea. From Cong I continued up through Ballinrobe and Claremorris, where I broke for a light lunch. At this point the idea occurred to me for the first time to journey 55k further that first day to the beautiful town of Carrick-on-Shannon. Could I do it? I said I'd assess the situation in Ballyhaunis. By this time the rain was heavy and falling steadily, I was wet to the bone but not overly affected by it. At Ballyhaunis I pulled over, got my phone out and called my brother Richie: 'book a hotel room for me in Carrick-on-Shannon, I'm going for it!'. From Ballyhaunis to Loughglynn and from there on to Frenchpark I felt great, but the rain got heavier and heavier, and the sky began to darken. It was past six now, but Carrick was just about 20k away. My legs were beginning to tire but I kept going on and on and on, wondering 'where is Carrick'? Eventually I saw the beginnings of a town and a sign that broke my heart: 'Welcome to Boyle!' AAAGH! I had taken the wrong road and ended up 15k off track! The constant rain and tiredness had left me dazed and dopey (what's new??!). I reached for the map in my rucksack but it was all wet and torn. As I stood forlorn on the side of the road a kind stranger put me on the right road again and I just put the head down and went for Carrick, reaching that wonderful town with clothes dripping wet at 7.30pm. 170km done. Tuesday: Following a sound sleep I awoke at 8am Tuesday morning, had breakfast, walked around Carrick and got back to my hotel room to prepare for the big cycle when the local radio station, IRadio called to arrange a meeting for 11am. Thank God, and Ronan, my runners were now once again dry (I had stuffed them with newspaper the previous night on big Ron's prompting). The radio crew were there to lead me all the way to Cavan, much to my shock and delight (word of my cycle had been spread by my radio-working sister in law, and I was the 'colour-piece' of the day!). This day was absolutely beautiful: sunshine, little breeze and the most beautiful lakeland countryside of Cavan and Leitrim. Thanks to my very long cycle the previous day, I only had 74k ahead of me on day two. I got to Cavan town, where the Fleadh Ceoil (trad music fest) was in full swing. I was so chipper I even had three pints of Guinness that evening! Wednesday: Day three was a pure lap of honour! There were only 74k left in my mammoth cycle and I was to be joined by brothers-in-law: Michael Woods, Michael Minnock, Benny, Mark, sister in law Theresa and friend Brian Murray. We set off from Cavan around 1pm, leaving a very busy road to head for Ballieborough, Kingscourt, Dromcondrath, Ardee and finally Stabannan. 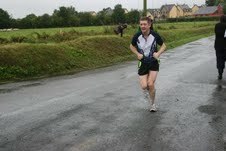 Outside Dromcondrath we were joined by Ciaran Maloney and the 'Champs Elysée' atmosphere was beginning to build! The town of Ardee, being our last 'town stop' was the start of the 'carnival' atmosphere, as we were greeted by 20 supporters, family and friends alike -most of whom hopped on a bike to join us on the last 9k journey to the village of Stabannan. On entering the village we were joined by about 50 others, children and adults, all cheering and supporting (little did I think this crazy idea of mine would grow such legs!). We raised €3,300 for the Jack and Jill Foundation and had a whale of a night! Men and women in the pub that night vowed to make it an annual event, in which they would all join in ( was that drink talk?)! All in all: 170k in day 1, 74k day 2 and 74k day 3. Not too bad! 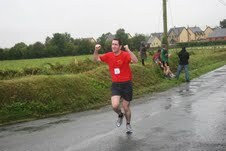 I still have to write about the Wexford 4mile Run - that should be a post of it's own tomorrow! The Big Cycle Starts Tomorrow! The day has finally come... tomorrow morning at 9am I'll set off for a 320k cycle from one side of Ireland to the other. It should take me 3 days - barring injury, extreme weather, bicycle damage or alien abduction! This is my little fundraiser for the Jack and Jill Foundation, to help parents of extremely ill children, and I'm delighted to say that I've collected well over a thousand euro so far... Thanks to everyone who has contributed - I'll let you all know how I got on and take some photos of the lovely countryside! I spent some of today's run in the 'little walking man' position! I came a cropper on my scheduled 12 mile run today. I finished, but only just and had to take a number of walking stops. Why? I'm not sure - there just wasn't any zing in the legs. Last week I cantered the 11 mile run as if it were nothing, but I've certainly been pushed a bit with this new cycle-Ireland project, so I may be overtraining... Another reason could be that I underestimated the humidity and had under hydrated - I certainly had no water on route and had drank very little before the run. At any rate, I ran and finished - no matter what shape I was in it will still stand to me. As for the cycle-Ireland project: we only have a week left before we head off across the country in aid of the Jack and Jill Foundation, so tomorrow Kevin, Mark and I will be heading for the hills on a 70k cycle. I hope the body recovers sufficiently in time! I'm planning to hop up on a bike on the 15th August and cycle across Ireland in three days, from An Cheathrú Rua to Stabannan, in County Louth, from where my good wife hails! Nothing MAD about that?? This is way out of my comfort zone - I got up on a bike for the first time in years last week and have been hardening my posterior in preparation for this trip ever since! All in all, it will be about 200 plus miles...phew! Of course, this challenge is for charity - I've just set up a secure web point for donations, so please consider donating the price of a pint (€4, £3 - or whatever you can give). Please read on - I'll sweat enough doing this so GIVE FULL ATTENTION!! Click here to donate a few quid!